When there’s something as monumental to celebrate as a second chance at life, you make the most of the celebration. For Amy Reiner and her cousin, Dave, that means giving the celebration its own name. Every year on Jan. 30, Amy and Dave celebrate Smittyversary. It’s a celebration named after the kidney Amy donated to Dave. They named the kidney Smitty, which led to the natural title of Smittyversary each year for the last 10 years. She’s also been a volunteer at Heartland Equine Therapeutic Riding Academy for three and a half years and absolutely loves it. “I am pretty hard working and have a wonderful sense of humor,” she said. 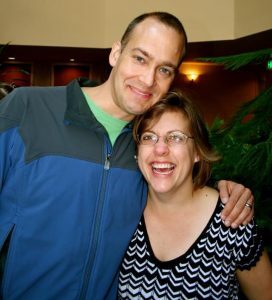 Ten years ago, Amy donated her kidney to Dave, who had polycystic kidney disease. This disease causes clusters of cysts to develop on the kidneys and sometimes the liver and leads to high blood pressure and kidney failure. Dave, however, was in North Caroline, and Amy was in Omaha. 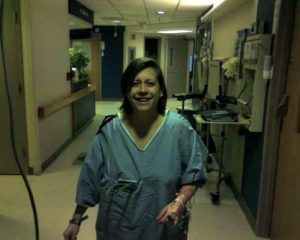 Most of the testing she needed to complete had to be done in Omaha and then sent to North Carolina, while the surgery was at Duke University Hospital in Durham, N.C.
Amy recalls that the testing process was long. The night before surgery, Amy said she didn’t sleep at all. After making it through, Amy said Dave started improving almost immediately. One of Amy’s struggles came after trying to head back to work too soon. Amy also struggled over that next year with some depression. Dave is still doing well, and Amy is currently looking forward to celebrating Smittyversary with he and his wife, Cathy, in Houston. Bluebarn‘s upcoming production I and You will feature a panel regarding organ, tissue and eye donation. The panel will follow the show’s Feb. 17 performance and will feature Amy alongside several other community members with ties to donation.